The small village of Maderi lies in the hills of northwestern Sumba. There is no paved road leading to Maderi. To access it, it is necessary to turn left from the road to the northern coast, drive for 500-600m, then walk up a small path for about five minutes. Maderi lies on a hilltop overlooking the plains surrounding it. 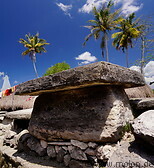 It has interesting megalithic stone tombs and other stone structures and a number of peak roof houses, both buit with traditional materials and corrugated tin. Maderi doesn't get many visitors.